I am exceedingly glad that I did not live in Victorian England. Male superiority, horrible hygiene, corsets, and all-across-the-board prejudice aside, how the hell did anything ever get done? After finally finishing Dracula, I closed the book with the distinct impression that an entire age of English civilisation passed with people talking around issues and giving their companions effusive compliments before doing or saying anything of value. And people think our age of over-the-top political correctness is bad. Just go back and read a story from the 19th century and you’ll be glad for it (well, kind of. I mean seriously, freedom fries? So glad that never took off. Politicians: distracting their constituents from the real issues with fluff arguments since the dawn of time). But aside from all the “Wow, you’re so good and noble and pretty and holy and I would gladly do anything you ask, [insert character name here]”, Dracula was actually an easy read. I don’t usually go for the classics. It’s a horrible, horrible habit especially for an almost-graduate of a literary degree, but it’s the truth. After having been exposed to the horrors of Jane Austen and Mary Shelley in high school, I always approach the capital ‘L’ Literature with some dread. This dread has lessened considerably since reading the wonderful work of Emily Brontë and Sir Arthur Conan Doyle, but there still lies that innate sense of impending frustration that comes with opening a classic. And, I don’t know if anyone else has noticed this, but the classics always have such a clinical smell to them. I once sprayed my copy of Pride and Prejudice with perfume so the smell wouldn’t hinder my ability to finish the book for class. If you don’t believe me, go find a copy of a book such as, say, Harry Potter give it a whiff and then go open Gulliver’s Travels and do the same. I guarantee you’ll find a difference. All that praise just so Van Helsing can ask Mina Harker to read some shorthand for him. Bloody hell. But I’m starting to rant, so I’ll move on now. With a careless motion, [Lucy] flung to the ground, callous as a devil, the child that up to now she had clutched strenuously to her breast, growling over it as a dog growls over a bone…There was a cold-bloodedness in the act which wrung a groan from Arthur [her former fiancé]; when she advanced to him with outstretched arms and a wanton smile, he fell back and hid his face in his hands. After pages and pages of exposition, comforting each other round-robin style, and compliment after compliment, you get smacked in the face with some fast-paced action. Beautiful. Manlike, they told me to go to bed and sleep; as if a woman can sleep when those she loves are in danger! And whenever a woman is complimented, it is always in deference to the superiority of the male brain and brawn, but the women are credited for their parts in the vampire hunting. They have important roles, and are seen to do things that the men cannot, like the scene above where Mina Harker is called upon because Van Helsing, a man, cannot read her shorthand. She is seen as being able to do something that her male companion cannot. And then there’s the fact that Mina Harker, at the end of the novel, wields a gun. Throughout all of the novel, she is seen as a delicate flower in need of protecting, but called upon she can fire a weapon like the manliest of men. To me, Mina Harker reminded me of a princess in medieval times, where the knights would go out and perform heroic tasks in the hope of winning her favour. There is a lot of talk throughout the novel of the men trying to do things for Mina’s soul, her goodness, or just her in general. It was a delightful image to play with, but I wonder if it was intentional. But there were some inconsistencies throughout the story that didn’t sit right with me. For one thing Dr Seward’s first name changed from John to Jack and back again a few times throughout the story. I don’t know if Jack was a nickname for John back in the day or if Stoker couldn’t figure out which name he liked more so he threw both of them in there. Another thing was the difference between Lucy Westenra’s and Mina Harker’s infection. Lucy needed regular transfusions of blood from her male protectors in order to stay alive, but Mina didn’t. Unless it was because the women were infected differently – Lucy was routinely bitten by Dracula and Mina was fed some of Dracula’s blood. But you would think, as Mina was slowly becoming a vampire, she would have needed the transfusions as well. And don’t even get me started on the fact that Mina was supposed to be “changing”, becoming less and less like herself in the latter stages of her infection, yet her diary entries still sounded as they had at the very beginning of the novel. Maybe Stoker’s readers were more obsessed with plot than characterisation, but that truly annoyed me. Her diary entries would have helped the men, as well she knew, so what was the point of her being recalcitrant off paper? It made no sense! Dracula is brilliant, if a little uneven, but I can definitely see why it is such a cult classic. No star rating, seeing as how this novel has inspired so many of my favourite modern books, but I will say that if you have a thing for vampire stories (real ones, not the ones where vampires sparkle like diamonds), then go back to where it all began. Read this book! This entry was posted in Extorting Bibliophilia, My Fangirl Life and tagged Bram Stoker, Cassandra Clare, classics, crucifixes, Dracula, garlic, gothic, horror, interpretations, Jonathan Harker, Literature, Lucy Westenra, Mina Harker, original, Richelle Mead, vampire, Van Helsing, verbosity, Victorian England, wolves. Bookmark the permalink. I totally agree with your vision of the book, while i could appreciate its ‘classicness’ and see how much it influenced the genre, the whole treatment of women/feminity made me grind my teeth. As if women were some sort of subspecies, not quite in par with men. And the whole duality of good versus sensual, mina versus vampiress was pretty diminishing too. I actually wanted to give a go to shelley after reading dracula but you seem to have had a bad experience with her work? What didn’t you like about it? Women are always seen as lesser beings in classic texts. Except maybe in Bronte’s work, but I liked the way Stoker dealt with womankind. I didn’t hate it as much as I usually do. I see what you mean, though, but they glossed over it a bit. You only get a glimpse of Lucy’s “wantonness” so I could overlook it. But yeah, the way that Stoker treats Mina and Lucy differently just really pissed me off. Consistency!!! And I definitely did have a bad experience with Shelley. I mean, I appreciate the metaphor behind Victor Frankenstein: he had to be so remorseful after creating his monster and going against God, so that the idea that God is all-powerful remained intact. But my GOD, he was a whinger. He complained and whined and bitched about what he had done instead of going out and doing something to rectify his actions, like hunting the monster down and killing him. I found myself wanting him to commit suicide when he was contemplating it, just so we could go back to another narrator. I loved the monster’s character: he was delightfully complex. So I would say give Shelley a go. The rest of the story is brilliant. A story within a story within a story. I just can’t forgive her for Victor. Maybe men were just wusses back then, I don’t know. But definitely have your own Frankenstein experience. I’d actually love to hear your thoughts! I’ve yet to read this but it is on my Classic Reading List! I’m buoyed by the fact that you came out of the other side relatively unscathed. I don’t have as much dread as I did before reading your review. I haven’t read it! Never seen the film adaptation either. I don’t read much gothic/horror stuff to be honest, I’m quite wimpy! Don’t worry, neither do I. I avoid it like the plague. But I make an exception for vampires. Maybe cos they aren’t real so I can comfort myself with that fact haha. It’s always good to see people read and understand texts I hold so dear as Dracula – may I suggest a couple of more books that we studied alongside this recently on a module I am studying? Prior to reading Dracula on the course, we read a text that until recently was out of print called The Beetle by Richard Marsh, and also The Blood of the Vampire by Florence Marryat. 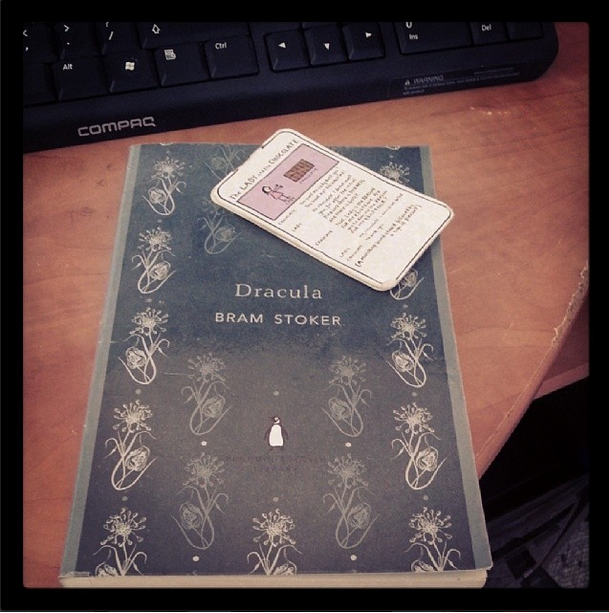 Both were written in 1897 (same year as Dracula) and display some of the anxieties that Stoker’s novel does. I am sure they will tag on nicely to the end of that ‘To Read’ list! I’ve always meant to read Dracula and when I found a book called Incarnation, which is based on Bram Stoker’s characters and even has Bram Stoker as a character, so I figured I should read the original before I read the remake. I’ll post the review of Incarnation when I’m done 🙂 And I live for new books to read! I will definitely have to find those. It’s actually kind of cool, that the current obsession with vampires means that some classic texts are getting a second life.